Watch Out For This Bear! When the attack occurred, Elliot Clark, then 11 years old, was walking through the woods near Game Creek in Port Frederick several miles south of Hoonah. The young outdoorsman was heading to a nearby fishing hole with his uncle, Craig Stoltzfus, Stoltzfus’ father, a cousin and three dogs. Stoltzfus and Elliot Clark were armed when a brown bear came out of the woods, charging the group head on. The other members of the party were not armed. The bear ran through the first two men, who were pushed to the side of the trail, leaving Elliot Clark in front of his unarmed cousin. 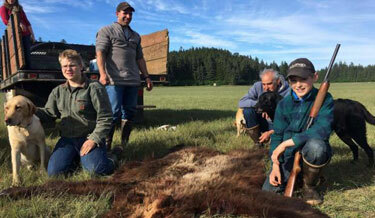 The boy raised his pump action shotgun and shot the sow, hitting it with birdshot, which is often used just to scare bears off, Lucas Clark said. The third shot went into the bear’s shoulder and his back, dropping it to the ground. The bear was so close when Elliot hit it with his third shot, there were powder burns on the bear’s mouth. Still alive, the bear then slid by Elliot’s feet. Stoltzfus finished it off with another round. Fox News reports that a Grizzly Bear taken last Fall near Fairbanks by a fellow out hunting moose has broken the Boone & Crockett record. 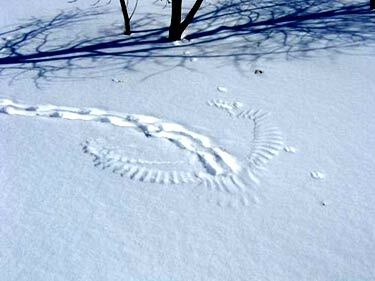 Larry Fitzgerald and a pal were moose hunting near Fairbanks, Alaska, when they came across fresh bear tracks in the snow. Three hours later, the auto body man had taken down the grizzly that left the prints, an enormous bruin that stood nearly 9 feet tall and earned Fitzgerald a place in the record books. 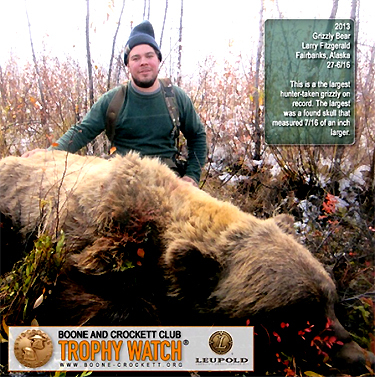 Although Fitzgerald shot the bear last September, Boone and Crockett, which certifies hunting records, has only now determined the grizzly, with a skull measuring 27 and 6/16ths inches, is the biggest ever taken down by a hunter, and the second largest grizzly ever documented. 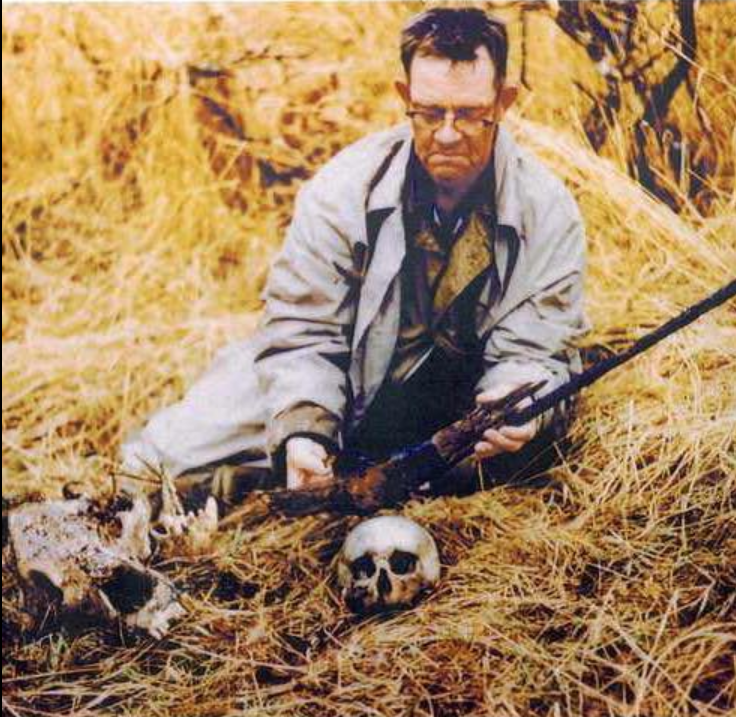 Only a grizzly skull found by an Alaska taxidermist in 1976 was bigger than that of the bear Fitzgerald bagged. 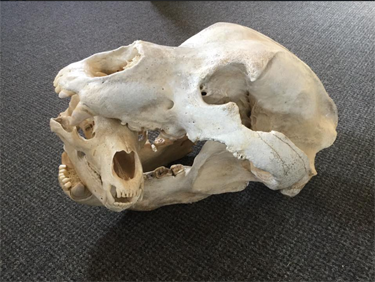 Bears are scored based on skull length and width measurements, and Missouloa, Mont.-based Boone and Crockett trophy data is generally recognized as the standard. Conservationists use the data to monitor habitat, sustainable harvest objectives and adherence to fair-chase hunting rules. The human won, but pretty narrowly. If you leave fish filets in the the back of your pickup at the Unalaska Safeway, you may find that you have a problem when you return from shopping. 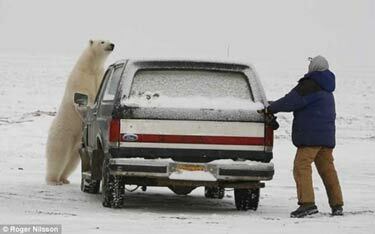 photo: taken in Bethel, Alaska by Susan Barstow. The fragment of leather on the broken bronze buckle was carbon-dated to 600 A.D.
A University of Colorado Bouilder archeology team excavating a 1000-year-old Inupiat Eskimo house at Cape Espenberg on Alaska’s Seward Peninsula found a partial bronze artifact resembling a buckle, which is apparently even older. 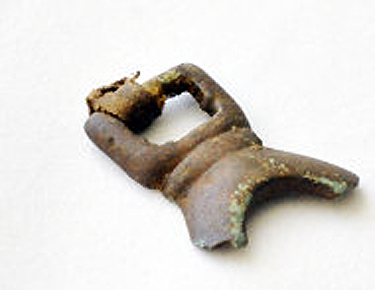 Bronze-casting is a technology not known ever to have existed in any New World culture, so the artifact was presumably made in Asia and reached Alaska by some unknown early system of trade. University of Colorado press release. Hat tip to Reid Farmer. Baby moose (and family) discover the joys of a lawn sprinkler, Anchorage, Alaska, June 2008. In Europe, they call these elk. the Archives of Never Yet Melted in the 'Alaska' Category.